A bout of lousy weather, in the form of ultra-humid rain, has left me unable to grill. Unfortunately the only option left was to use the oven. A dim prospect in this unseasonably warm temperatures, yes. However, it's all in the name of having a delicious dinner which is of paramount importance. A few times a year I'm able to procure fresh garbanzo beans. It's a treat to eat these during their brief season. Luckily a year is long enough to forget how terrible a task it is to peel them one-by-one. 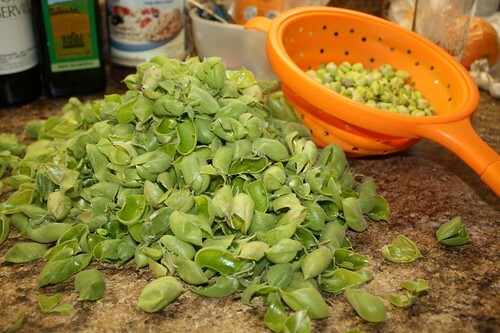 Over a pound of beans results in this pitiful yield of fresh beans. I cooked up the garbanzos with just a little butter, olive oil, garlic, and parsley. I was also fortunate enough to get a nice veal chop from Provitello Farmsin Elba, NY. For you history buffs out there you'll remember this is where Napoleon was exiled after his defeat at the Battle of Leipzig. For what they lack in maintaining Napoleon's exile they make up for in producing excellent quality veal! Also to accompany these lovely items: some more shiitake mushrooms from New Jersey. 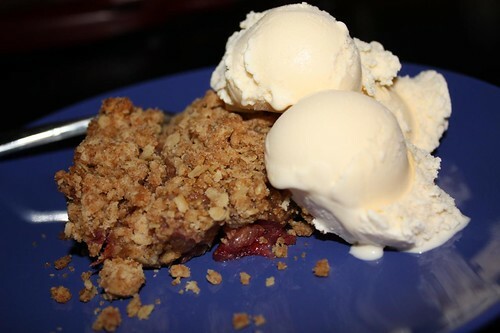 Jen also woke up early this morning to make this fantastic strawberry rhubarb crisp (an abandoned strawberry rhubarb pie). Topped with a little vanilla ice cream it was pretty much the most delicious dessert one could ask for on a disgustingly humid May evening. Jen's recipe called for the cut berries and rhubarb to be tossed with a little sugar and flour and then sit for one hour. Always one to up the ante, Jen allowed them to sit for two days. This was fueled by a need to overdo it in tandem with a lack of desire to make pie crust. The charm of this Spring meal may have been a bit more enjoyed had it not been for the scorching heat and humidity in our apartment. 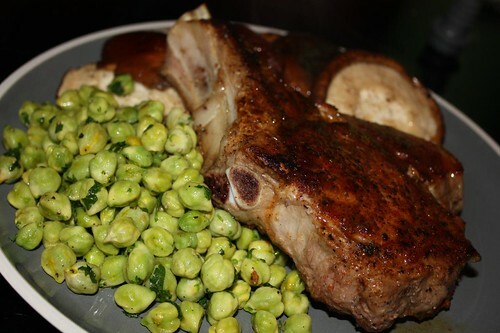 It felt more like we'd frozen the garbanzo beans and waited until late July to have this meal. Hopefully there'll be a chilly day in late July where we can have ribs and corn on the cob to even this all out.